Every so often, I open up my listing of trains I am modelling and add more information to the spread sheet where I calculate model train lengths and tonnage. The longest trains that will run on the layout are the Up block wheat and coal, and all of these have four locos up front, with generally two of these being the bank engines. I was always hoping to be able to run prototypical length trains, but found I had an issue with the road lengths in the Up Staging. 5400; 4340; 4200; 3570; 3500; 3500; 2790; 2790. As can be seen, there was no way I was going to be able to fit these trains into the four longest roads. In hindsight, I should have made the Up yards much longer than the Down yards, but instead made them roughly equal lengths. So to accommodate the long trains, I have decided to rebuild the Up yards using 3-way turnouts in certain locations to lengthen the roads. I will only have to build three new 3-way turnouts. 5495; 5080; 5060; 4765; 4310; 4070; 4030; 4020. On one of the wheat trains, I may have to drop up to two wagons, and on one of the coal trains, one wagon. This will still give me near prototypical length trains. The drawing above shows the differences between the old and new yard design. The majority of roads are now significantly longer than in the old design. Sorry for the delay in blog updates recently but I have been busy both on the layout and around the house. There will be a few updates in quick succession. After much thought and discussion with Andrew over the last nine months or so, we have decided to abandon Proto-87 wheel and track standards and to adopt the NMRA Fine:HO track and wheel standards. 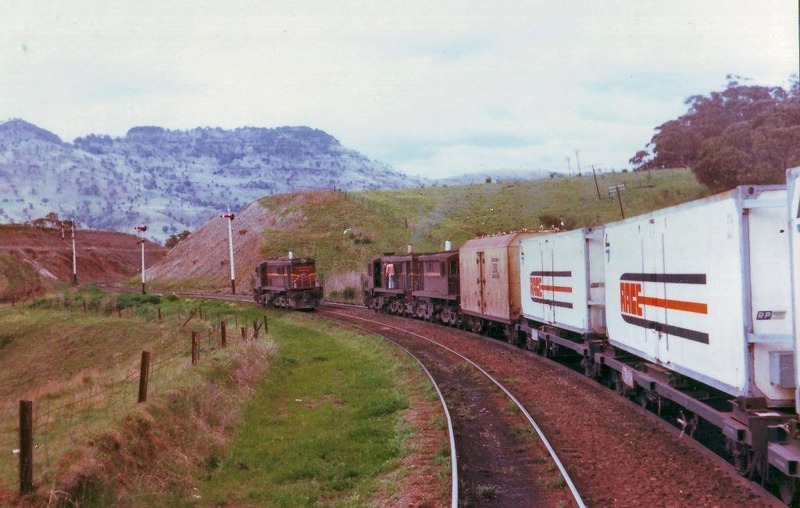 Ever since we built Bowen Creek, we thought that diesel locomotive conversion was going to be straightforward – just a matter of swapping out the wheelsets. However, during the few outings of the layout, we soon realised that some form of suspension was required to keep the wheels on the rails. Since the P87 flange depth is only around 0.3mm, the slightest bump in the track or lack of lateral movement in the axles would cause the wheels to ride up over the railhead, most frequently on curves. These issues, we found, relate mainly to three axle (Co-Co) bogies, and the centre axle in particular. So, most of you may not be aware, but over the last three years or so, we had been developing a suspension system for retrofitting to RTR locomotives to enable the use of P87 wheelsets. With greatly appreciated assistance from Andrew Lee of AndIan Models, we had designed an etched suspension ‘kit’ that would have replaced the pickup plates on the locos and incorporated sprung axle boxes. Our initial testing, on the Trainorama 47 class bogies, proved the concept worked, but over time we realised that there were major reliability issues. On the test track, the loco would run OK in one direction, but not the other, and derailing on curves was still an issue. We both realised that whilst Proto-87 certainly looked nice, to get the suspension to work reliably on the locomotives was going to mean far too much work, and neither of us were prepared to further invest that amount of time and finances. We both have layouts to build and quite substantial locomotive fleets to convert!! Also, with the release of the new Auscision 45 class, it was noticed when I pulled a bogie apart, that the design of the pickup system is totally different to that of a Trainorama locomotive, which made the conversion to P87 almost impossible in my opinion. So with heavy hearts, we are heading down the RP25/88 wheel route. These wheelsets comply with the NMRA Fine:HO standards, and by keeping a track gauge of 16.5mm, we can achieve a flangeway of 1mm. There is a requirement to open out the back-to-back of existing wheelsets to a minimum of 14.8mm. 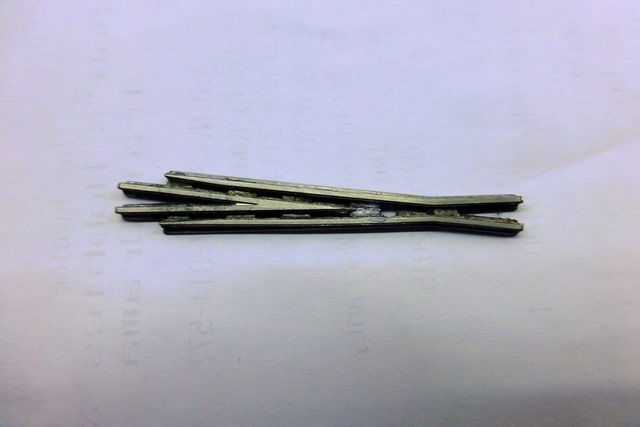 Generally this is only about an increase of 0.2 to 0.3mm from factory wheelsets. RP25/110 wheels will also still run through these frogs with a back-to-back adjustment. Using the information in the NMRA standards S-3.1 and S-4.1, I have come up with a single page datasheet with all the relevant measurements shown. Click on the image to open a larger PDF. I have commissioned Keiran Ryan to design and manufacture some new etched vee crossings to suit code 70 rail with a 1mm flangeway in both 1:6 and 1:8 sizes. I have recently received the first test etches of these and they are very nice. With some minor corrections to be done, it is hoped I will have the production versions in a month or so which will allow me to continue on with the much delayed task of turnout building, along with changing out the thirty two vee crossings in the staging yards. 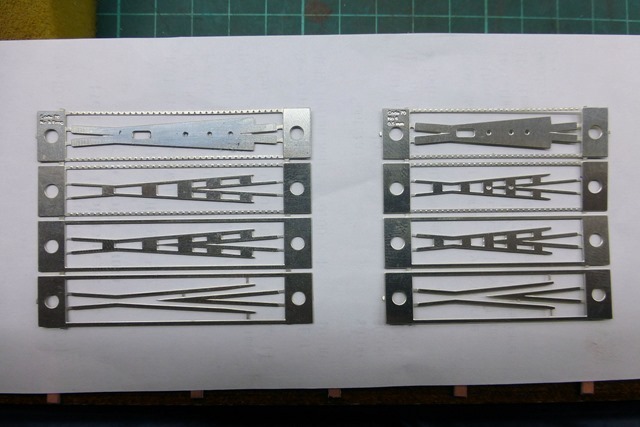 The images below show the two test etches for 1:6 and 1:8 vee crossings, the 1:8 crossing assembled and removed from its fret, and the 1:6 crossing installed in a section of track to test wheel operation. 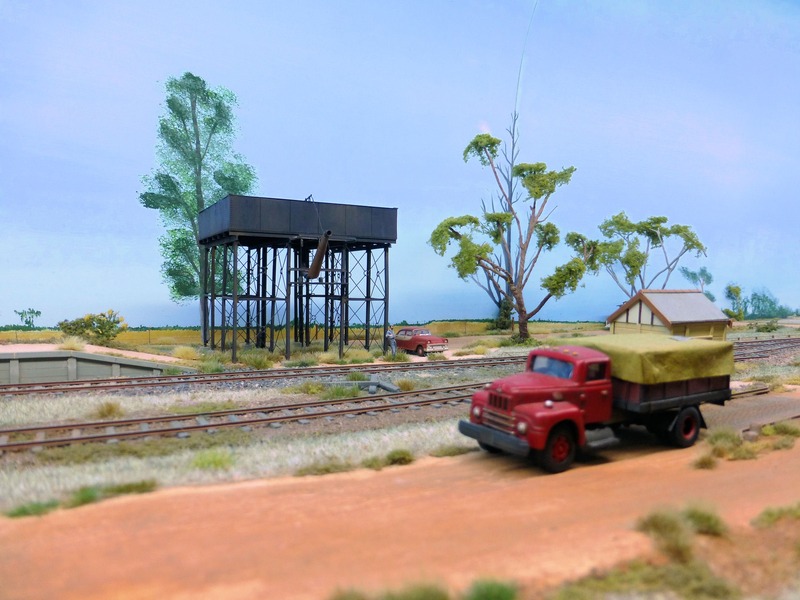 Back in 2013, a mate who is a driver for Pacific National, took some video for me of a trip over the area I am modelling. Things are quiet on the layout at the moment but I hope to resume work soon to commence laying of the CV track in the Temple Court section. Meanwhile, since the inclusion of Temple Court into the plan, I have revised the Google Earth view that was originally posted here. This has added around 0.9 miles (1.5km) to the scenicked part of the layout. This is shown in the short yellow section west of Temple Court. The blue section is essentially the hidden track in the helix. This is 2.4 miles (3.9km) on the prototype. Click the thumbnail below to see a bigger version. It will open in a new window. The other week I was notified by an email from Opera that by April 2014, they are closing down all blogging sites they host. So, I have managed to transfer all the posts from when I started the blog in November 2008 to when I started the current WordPress blog in May 2011. The current blog now contains all the history of Liverpool Range. I had always planned for the section from the bottom of the helix back to the storage yards to be hidden. A couple of months ago, Andrew suggested I look at making it into a scenicked section, with the possibility of adding another crossing loop. I shied away from the idea at first, but just recently, he raised the subject again! His idea is to be able to bring a Down train out of the storage yard and wait in a crossing loop scene for an Up train to arrive from Pangela via the helix. If the section is hidden, as was originally planned, a Down train leaving the yard heading to Pangela has a long trip before it enters into a scenicked area. The proposed new scene would at least give the operator something to look at whilst he waits for a train from Pangela. After thinking about the whole idea, I began to like it more and more. Damn it Andrew – what have I told you about thinking about stuff! The problem now was to come up with a location to model. 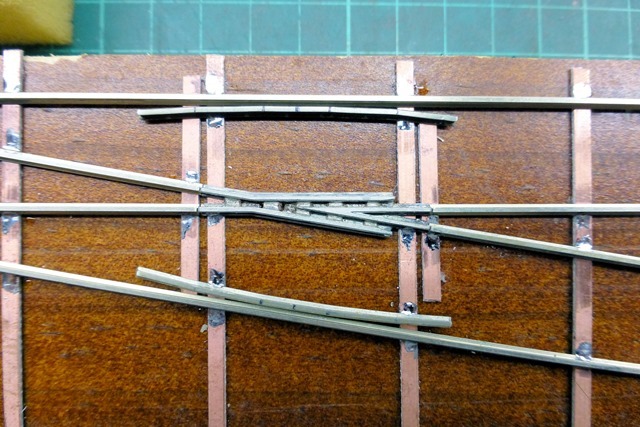 As I really only had room to model another crossing loop, I only had about three locations in mind to choose from. I didn’t want to model something too far away from Pangela, but far enough to give the illusion of distance. Murrurundi was out as it was a major yard and depot. 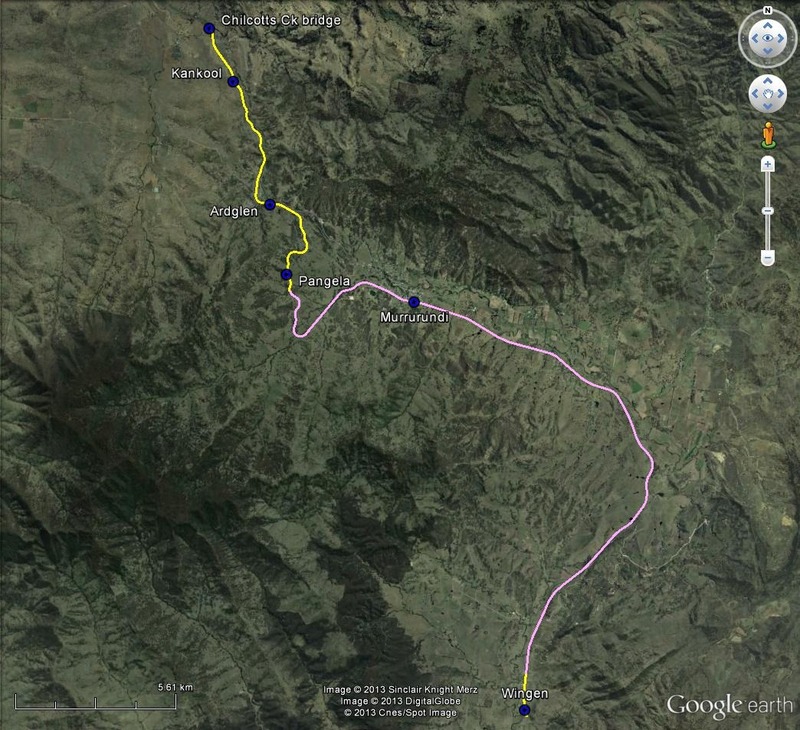 The next three locations down the line were Blandford, Murulla and Wingen. A quick search on NSWrail.net found only modern photos of the now gone Blandford, zero photos of Murulla, and some quite good photos from the late 60’s and 70’s at Wingen. 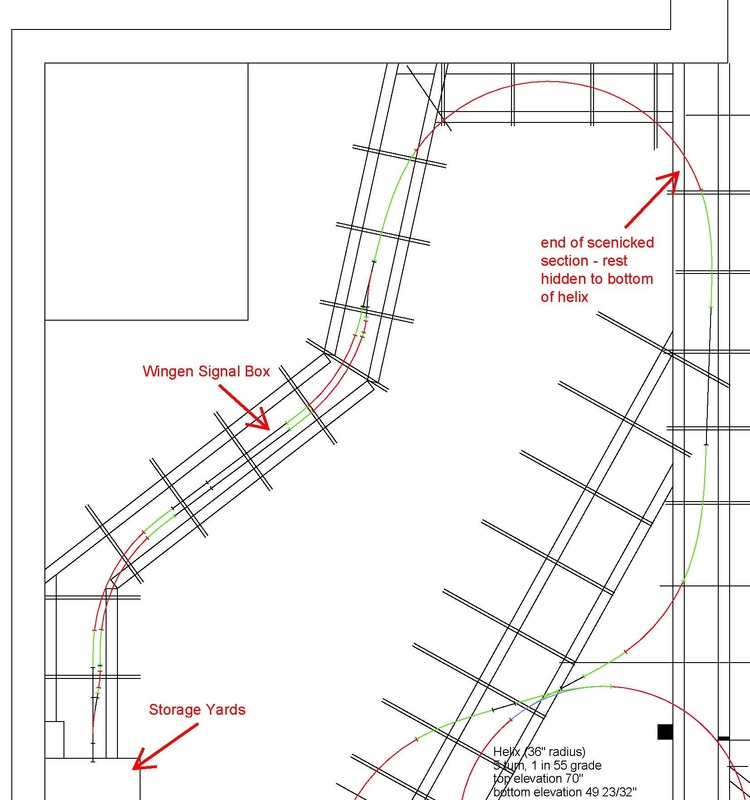 I then spent some time redrawing the section from the helix to the storage yards to incorporate a crossing loop, and eventually came up with the design shown below. At this stage, it’s a first draft, and I’ll probably refine it over time. The overall track geometry did not change much from the original plan. Standing room in the loop as shown in the drawing is about nine feet, but when built, I’m hoping to be able to extend this a bit more, up to probably around ten and a half feet, which is a fraction longer than Kankool. The same grade was kept at 1 in 55, albeit a bit steeper than the rest of the layout at 1 in 84, but this shouldn’t be a problem for trains, as the helix is at this grade anyway. After some correspondence with a few people to obtain some more pictures of Wingen, it was decided this would be the location modelled for the new crossing loop. Wingen was 28 kilometres (17.4 miles) from Pangela. As can be seen above, the original signalling diagram from 1948 showed a goods siding as well as the crossing loop. From the photos I have acquired, it appears the goods siding was still in use around 1980, but the goods shed was gone. The loading bank and stock races will probably be modelled in a run down form as well. It appears that the station building was there, but at this stage I am unsure what type it was. 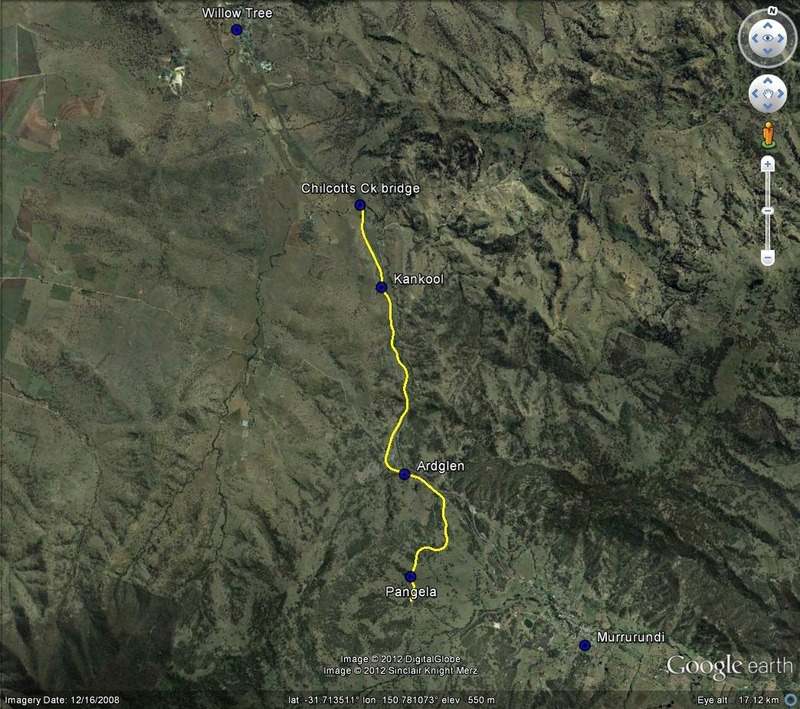 The image below is a revised Google Earth plot of the layout route, now including Wingen. The pink line shows what will be the ‘hidden’ section from Pangela’s Down Distant signal, down the helix to Wingen’s Up Distant signal. Wingen is shown in yellow. I have been given permission from various people to use their photographs. Below is a small selection. Hover your mouse over them for a description. I will place larger versions on the Liverpool Range Scenes page. I am pleased Andrew has convinced me to add this fourth location, as it should provide some interesting modelling, and will be different from the other three locations. Well, another year has passed in the life of Liverpool Range. Just quickly looking back through the archives, I achieved quite a lot in 2012. To summarise, 95% of all lower deck benchwork was completed, a five turn helix was built, half of the run from Chilcott’s Creek bridge to Ardglen had the grade set and 75% of turnouts in the storage yards were completed, wired and had point motors fitted. Construction was also started on the bridge spans for Chilcott’s Ck bridge, courtesy of brass etchings done by AndIan Models. Some shiny new models were also received during the year, but not as many as hoped. C’mon Trainorama, where are the 48’s? commence upper deck construction towards Kankool & above storage yards for Ardglen. 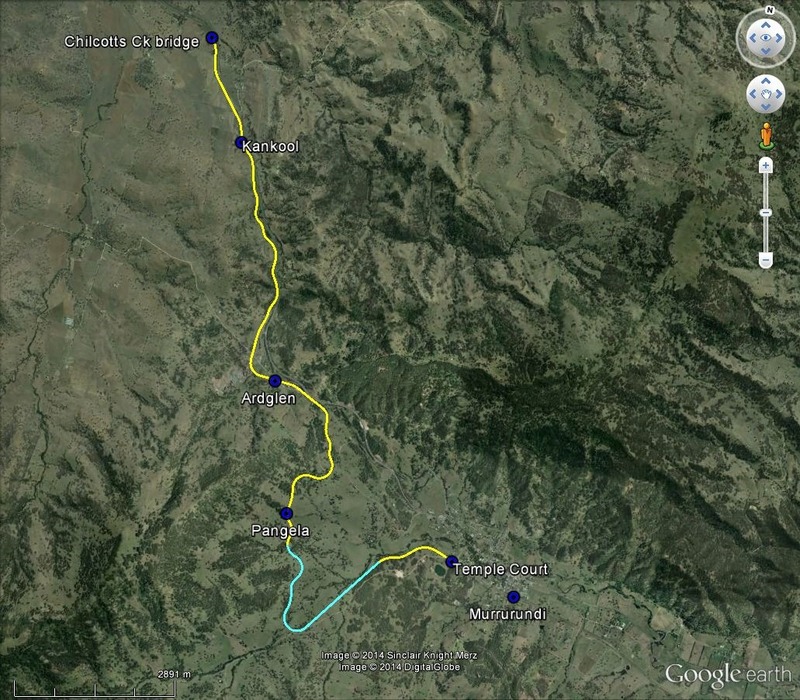 Just for a bit of fun, I have plotted the section of the Main North railway that I am modelling between Chilcotts Ck bridge and Pangela in Google Earth. I have also marked the locations of the three crossing loops (signal boxes). The prototype length is 7.1 miles (11.3km). The same distance on the layout equates to 5.3 scale miles (8.5km). This is 75% of the prototype distance. Click the thumbnail to see a bigger image. It will open in a new window. As the layout room is now virtually complete, over the next few months, the layout will begin to take shape as I start on the benchwork. There will be extensive posts on the various aspects of layout construction including, but not limited to, benchwork, tracklaying and turnout construction, scenery and electricals. I am really quite excited about finally being able to start my layout that I have been working towards for the past 20 years.